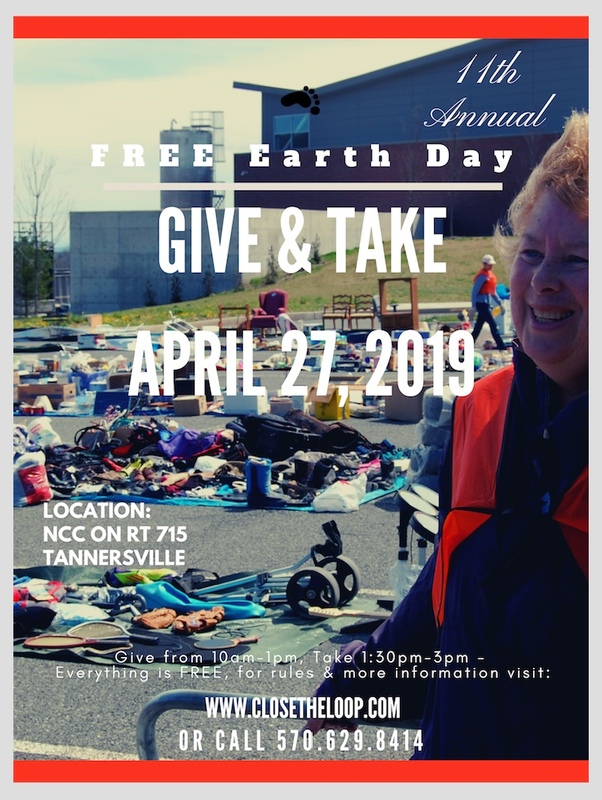 OUR NEXT GIVE & TAKE DAY WILL BE ON SATURDAY, APRIL 27, 2019! This is a great way to reuse items that are too good to throw away but you just don’t have a use for them anymore – just bring along any reusable items (nothing larger than 1 person can carry) between 10am and 1pm, then take away anything you want from 1:30pm to 3pm – it’s free! (you don’t have to bring something to take something). Example of what you can bring: household goods, pots/pans, toys, bric-a-brac, bikes, plants, kitchenware, garden tools, small furniture (must be in good shape to be accepted), gently used clothes, etc. Examples of things that will not be accepted: electronics, TV’s, computer monitors, tires, Household Hazardous Waste (HHW), mattresses, broken items, etc. You must provide your own vehicle for transporting items. There will be volunteers assisting and reviewing the items being dropped off. Your help is so greatly appreciated and it is a lot of fun helping people and the planet by reducing waste, saving money are re-using items that would have gone to landfills!! All leftover items stay within the community and are donated to local non-profits, churches, etc. If you can't come, please contact us to get the free toolkit to hold this type of event in your area! Please download the 2019 flyer here and post at your local post office, grocery store, etc, thank you! !